Flame Arrester Manufacturing & Sales. 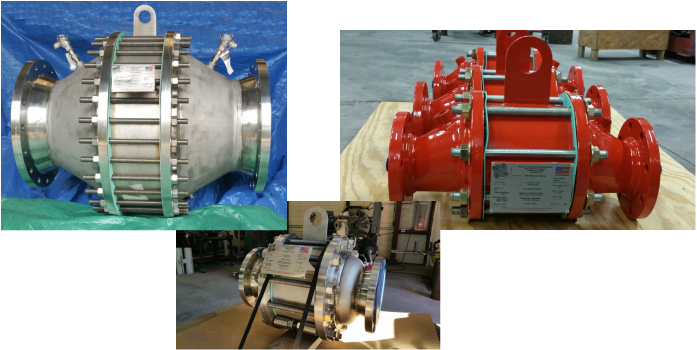 Photo above Left is a Model A-16C-GD-S1-S1-TD a 316SS Flame arrester and below that is a custom made 8" 304SS flame arrester that was built to fit into an existing piping system that could not be modified so we made the arrester to order as we often do. Photos of the red flame arrestors are Paradox Model A-4E-GD-CS-S, a group "D" Flame Arrestor. Flame arrestors, (also spelled flame arrester), are a critical safety devices and a component in the safe operation of vapor control systems. Flame arrestors are passive devices with no moving parts. They prevent the propagation of flame from the exposed side of the unit to the protected side by the use of metal matrix creating a torturous path called a flame cell or element. All flame arrestors operate on the same principle: removing heat from the flame as it attempts to travel through narrow passages with walls of metal or other heat-conductive material. An inline flame arrestor or end of line flame arrester are used to protect storage tanks or in systems with short pipe lengths (no more than 10 feet) from the possible ignition source, . Flame arrestors are very common devices that have been used for at least 100 years. Some flame arrestor manufacturing companies have had the end sections cast off-shore in an attempt to keep cost down. These casting have been reported to fail during assembly in the field from nothing more than an operator tightening the bolts during an element replacement. Not only are Paradox flame arrestors competitively priced, (in most cases less expensive) they are made from standard ANSI certified and rated components that will never break during normal use. See our Series A, AV, ASV & A-TIN Flame Arrestor products! Above: Explosion of Oil rig possibly due to improperly place flame arrester. Below: Flare stack. HP Deflagration flame arresters (flame arrestors) are an inline flame arrestor that will stop the propagation of a flame front that has higher pressures/velocities from a deflagration than a regular flame arrester can deal with. Quoted text from API 2028 5.3 POTENTIAL EFFECTS OF INSTALLATION GEOMETRY The geometry, size, and length of piping and piping systems are important to consider when selecting a flame arrester. It is possible that the level of turbulence generated by combinations of these factors may render a fame arrester incapable of quenching a fame front. Studies have noted that a correlation of the performance of a fame arrester and piping size is not always possible. It may be necessary to have tests performed for the particular size of fame arrester proposed for use. As per API 2028 5.3, our Series "B" HP Deflagration Flame Arrestors are designed and tested in pipe sizes 2", 3", 4" , 6", 8", 10", & 12" in an actual application simulating a short flare stack of 60 feet with a 90 degree bend at the bottom. A detonation flame arrester is a device fitted to the opening of an enclosure or to the connecting pipe work of a system of enclosures and whose intended function is to allow flow but prevent the transmission of flame propagating at supersonic velocity and characterized by a shock wave (designed to prevent the transmission of a detonation). Detonation flame arrestors (detonation arresters) give the best protection available in a passive device. 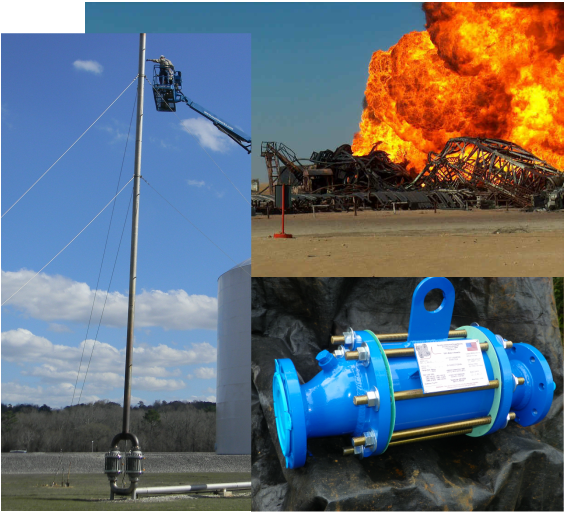 They can be mounted anywhere in the piping system and can stop the propagation of all types of deflagrations, over-driven detonations, stable detonations and any flame propagation phenomena possible. They are typically used in Marine Fueling Terminals, Refineries, Petrochemical plants, Trucking Terminals and where-ever long lengths of pipe are transporting ignitable vapors. More than any other flame arrester manufacturer; Paradox Intellectual Properties has 96 detonation flame arrester models that have been "Approved" by the United States Coast Guard for use in Marine Vapor Control system applications. This technology has been used and proven in the industry for more than 20 years. See our Series "C" & C-FH Detonation Flame Arrestor USCG Approved products.